Let's be honest: you probably don't know enough Jazz Guitar Standards tunes to jam with a fellow jazz musician for an hour. And the problem might simply be that you are not taking the necessary steps to really learn the tunes in question. In the midst of teaching, coaching and creating new lessons for JazzGuitarLessons.net I recently realized that most students may know a few to a lot of chords, scales and arpeggios (and the theory around that) ... but very often lack a decent repertoire of common standard songs. And by "decent" I only mean knowing five to ten tunes!!! Think of an athlete specializing in 100-meter dash (sprinting). But he only trains with squats and bench press at the gym... without running at all for months at a time. Why not train in doing what he wants to do in the end and sprint a little bit every week / day? So, read on for some advice and seek to understand which of those widely underrated steps you can take (now) to add more songs to your Jazz repertoire. You cannot memorize a new song simply from a chart. The info that is on the piece of paper is NOT the tune. The music is in the ears. The lead sheet is ... well ... just a cheat sheet to remind you of the harmonies and melodies. Sure, the Sher New Real Books are great ... but you should have a recorded "model" of the standard you want to memorize. Pick one classic (or obscure) performance of the piece in question as your template for the melody and chords. Action step: Get a good recording (and listen to it!) for any new song you want to learn. Commit the tune to memory, in your ears. Or sing along if you can. Sound is in the ears. Not in the fingers. Please dismiss teachers instructing you to learn any new Jazz standard melody "in 2 positions on the fretboard" as a first step to learning any standard tune ... this is BS. I have yet to find the rationale behind teaching beginners to use positions when learning melodies. I don't see the point, or the gain in sticking the fretting hand in one strict position. There's simply no added benefits ... so why do it at all?!? Learn to play the melody (from memory) in one way that feels comfortable to you now. Make it very concrete and "formalize" this way of playing the single-note melodic material so you always play it the same way every time. The way you play a certain melody on the fretboard may change over time, and that's okay. It will happen naturally as you get accustomed to the instrument and the layout of the notes. Furthermore, whenever possible, attempt to use the top two strings on the guitar when learning to play a new (or unfamiliar) melody, playing in a more horizontal fashion. This will come in handy when you want to create a chord melody (on your own) later on. Action step 1: Learn any new melody on the top two strings of the instrument AND use the same fingerings systematically (same way every time). DON'T restrict yourself to a scale position whatever other people say. K-I-S-S : Keep It Simple Stupid. ... and avoid sounding like you are just regurgitating some intellectual concepts. So once again, never mind other teachers telling you "you should know all the chords in the song as drop 2 and drop 3 with 5th string and 6th string root, etc." ... in fact, what you really need (at first) is to be able to play through the complete form with appropriate chords in the right place. Not rocket science! A good place to start is the 2nd page of most jazz guitar tunes found on JazzGuitarLessons.net ... see the PDF for Autumn Leaves here for instance. As we did with the melody in step -1- above, use the same chord shapes systematically every time. Note: Nothing fancy is required here ... plain 7th chords will suffice at first. When you get to a point where you want to add extensions (9th, 11th, 13th), re-do the process again. You should, of course, play the melody (-1- above) and the chords (-2- above) with a good sense of pulse. That means in time without hesitation or stopping. We want to practice and memorize in tempo because that's how we'll wind up playing in real life. Seldom will you perform jazz standards out of time, rubato. But this blog post is all about learning new songs, right? Since you are trying to memorize those things (chords and melodies), you may find it challenging to play without mistake in a good tempo right from the start ... enters the scotch-tape method. Divide the materials you are attempting to learn in small chunks (2 to 4 bars, depending). Call them parts A, B, C, D, etc. Practice part A for a while until you have it fully memorized. Play A in tempo perfectly at least a few times. Put this on hold. Practice B for a while until you have it fully memorized. Play B in tempo perfectly a few times. Scotch-tape A and B together. That is: play A and B consecutively, without stopping, in good tempo, from memory. Now put this on hold. Take C ... memorize ... then play in tempo perfectly a few times. Keep adding to this "rope" of musical bits until you're finished learning the song. Only add one "letter" (part) at a time. Don't take bigger bites, it won't work in the long run. We do this as to avoid attempting to play through entire songs while always repeating the same mistakes (and thus having to stop) at the same spots within the form of the tune. Action Step 3.1: Scotch-tape the heck out of parts of songs you are having trouble memorizing. Melody or chords. Or both! Keep good time, always. Action Step 3.2: Make a special effort (from now own) to play in strict tempo when learning chords and melody. Even if it is slow, it should be with a pulse. Make it a habit. -4- Dismiss the Chart ASAP! Playing Jazz music is all about sounds, grooves, musical interaction, refining ideas, elegant harmonic conceptions ... basically everything that happens in the ears and brains. By using the scotch-tape method described above in -3-, make it your number one priority to stop looking at the chart as soon as possible (if you're using sheet music at all). You'll be glad you did. Why can't you just constantly have a fake book at hand when jamming on favorite standards? Because when your mind is busy reading, it cannot fully appreciate certain other aspects of the music that are happening in the moment. Your listening is impaired ... so is your creativity. I believe it is Pat Metheny that said somethings along those lines: "How can I be expected to play music if I'm wondering if the next chord is Bb7 or Eb7?" And of course, Pat always plays 3-hour concerts without looking at sheet music. Action Step 4: Practice and play newly learned Jazz standards by rote A.S.A.P. Refer to -1-, -2- and -3- above. If you are a complete beginner and have never played any Jazz standards before, you may skip this step entirely and come back to it later. Nevertheless, it's a nice little icing on the cake for newbies and chord melody playing can motivate you to continue learning more jazz songs. In brief "Chord Melody" refers to playing both the melody and the harmony of a given song at once. On the guitar, this can prove to be moderately challenging. Let's keep it simple for now: see if you can "wing it" and play some of the chords to the tune you are learning "under" the melody. Don't overdo it. The melody comes first and the chords are only there to accompany it! I believe it is John Scofield who said something about learning a tunes's melody and then slowly figuring out a way to fit chords underneath ... all the while NOT forcing a precise chord melody arrangement on the song. Great wisdom! Basically, Scofield is trying to find what he can do with a certain set of chords accompanying a certain melody. 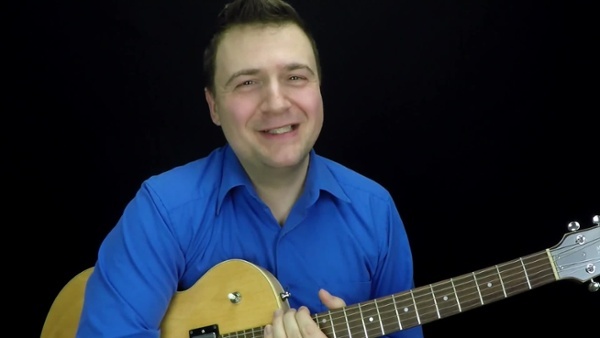 Action Step 5.2: Take the FREE Beginner Chord Melody eCourse on JazzGuitarLessons.net and see how you can take a simple tune like Summertime and create a neat (and easy to play) chord melody arrangement for Jazz guitar. This is the step I want to spend the least amount of time on. Most likely, this is where even the beginners are the most comfortable: scales and arpeggios! People will usually become psychotic when they witness the vastness of all the possible guitar techniques: "OMG, I must learn all m7(b5) arpeggios on two octaves before I can do anything or play on standards for real." My advice is: don't wait. Learn just what you have to know on the tune you are learning. No more, no less. Basically, you should simply build a small tool kit on each Jazz standard you learn. This "kit" typically consists of scales and arpeggios that fit over the chord changes in the song structure. For instance, here's how you can apply scales to a blues in F.
And here's how you can apply arpeggios to the blues in F.
Action Step 6: Learn one scale for each chord in the song, and play it up to the 7th degree, in eighth-notes. Up to the 7th and back down to the root if the chord lasts two bars. (See the scales outline on the F blues above as a guideline). Always play in good time. Optional Action Step: learn basic 1-3-5-7 arpeggios on the tune at hand. One arpeggio for each chord. One-octave version in quarte-notes, two-octave version in eighth-notes. WARNING: You should only work on those tools for improvisation once you can play the melody and the chords perfectly, in time. Not anytime sooner! If you don't know the song (the melody, in fact), then you don't really know what you are improvising on, don't you? -7- The Checklist "To Keep it Real"
Ok, let's cut the crap and go back (again) to the essence of learning Jazz standards for guitarists: I really don't mind if you are able to comp drop 2 and drop 3 chords or know all the two-octave arpeggios for every chord happening in the song. You know what's more important to me (and to anybody in earshot)? Here it is: Can you play a decent version of the tune without stopping? for a chorus each, then you know the tune. Action Step 7.1: Play the 4-chorus exercise to assess whether or not you know a song. Wherever you are weak (melody? chords? Improv?) go back to learn the tune deeper on that topic. Action Step 7.2: Start a list of memorized Jazz standard tunes for which you can easily perform the 4-chorus exercise. Keep this list handy and review the tunes you know often (maintenance). Bonus Action Step: Give yourself a deadline to have TEN tunes completely memorized on your list. I've seen many beginner go from zero to ten in 3 months. What do you think? Are you usually following some (or all) of these 7 steps while learning new Jazz guita tunes? Let me know by posting a comment below.